When Ferrari introduced the Enzo in 2002, its Formula One team was in the midst of a dominant period, winning five constructor’s championships on the back of Michael Schumacher’s five consecutive driver’s titles from 2000-2004. The timing could not have been better, as the Enzo reflected recent developments in racing, and was the first Ferrari supercar since the F50 of the mid-1990s. Anticipation was high upon the model’s introduction. With its Pininfarina-designed bodywork protruding forward like an F1 car’s nosecone, the Enzo looks the part, though it is beneath the carbon-fiber bodywork where the technology is truly borrowed from Ferrari’s racing program. Notably, the Enzo is equipped solely with a six-speed, electro-hydraulic transmission actuated by steering-wheel mounted paddle shifters. Carbon-ceramic brake discs some 15 inches in diameter provide stopping power not unlike that of a true racing car. The suspension employs unequal-length wishbones with pushrod-operated springs and electronically controlled shock absorbers that can be adjusted from the cabin. Standard traction control offers both a “sport” mode and a “race” setting that allows for some wheelspin, plus the system can be entirely deactivated. A racing steering wheel is encrusted with five LEDs that illuminate in sequence with the tachometer, but the rest of the cockpit is somewhat Spartan. Ferrari fitted the Enzo with automatic climate control but no radio, and windows are operated by hand cranks. 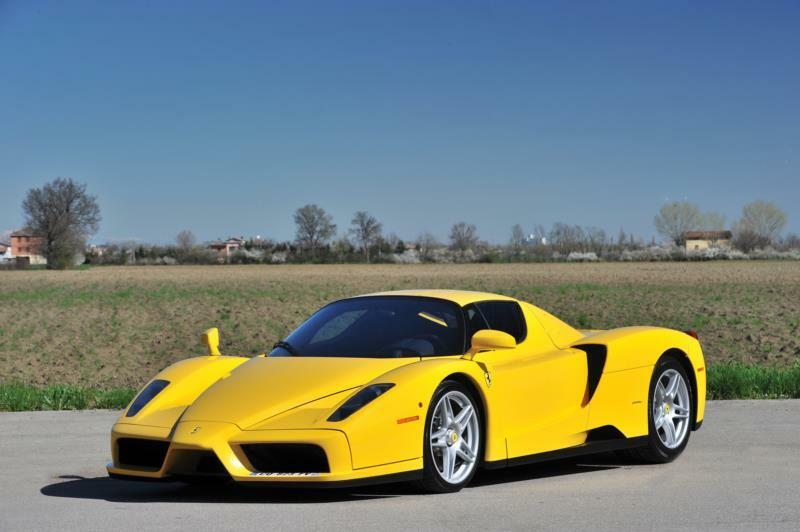 The Enzo is powered by a mid-mounted, 6-liter, 48-valve V12 making 660 horsepower and 485 lb-ft of torque. Road & Track found that good enough to propel the car to an unbelievable 3.3-second 0-60 mph time. The quarter-mile took the magazine just 11.1 seconds and they hit the traps at 133 miles per hour. 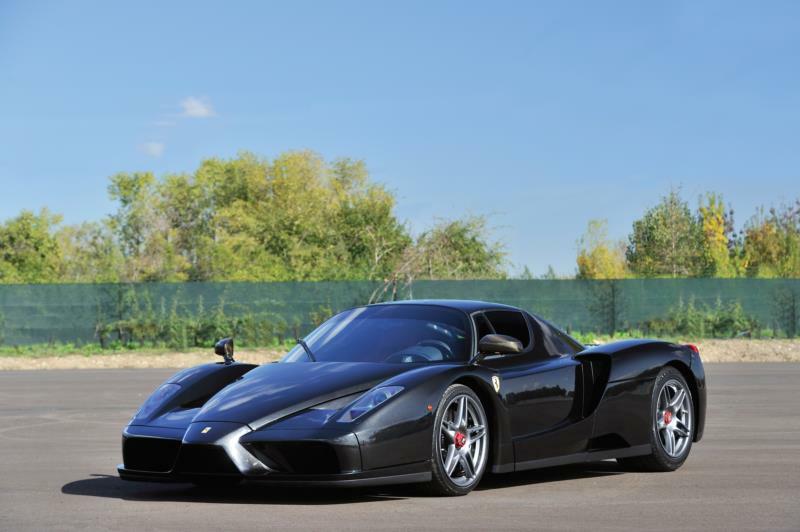 At a curb weight of 3,230 pounds, the Enzo is capable of an estimated 218-mph top speed. Despite having a staggering horsepower figure, aerodynamics are an equally big part of the Ferrari Enzo’s speed, and one of the Ferrari engineers’ design goals was to eliminate the boy-racer wings that had graced Ferrari’s two previous supercars, the F40 and F50. So the Enzo has numerous inlets and outlets tucked under and around its body to manage airflow. An inconspicuous rear wing deploys at speeds over 37 mph, and works in conjunction with two hidden flaps at the front of the car to maintain ride height and stability. While the Enzo offers the performance of a true supercar, it also has a reputation for providing a docile around-town driving experience. The front suspension can even be raised by 1.2 inches to allow for clearing speed bumps and driveway thresholds. The Enzo Ferrari only remained Ferrari’s top “production” car until 2005, when 29 FXX variants of the Enzo were created. Nonetheless, it is one of the best cars ever produced by one of the best car manufacturers extant. The Enzo is an impressive combination of unbridled performance and streetability, and with only 400 built (80 of which were designated for the U.S. market) it is all but guaranteed to remain an important benchmark in automotive history.